This Homemade Peanut Butter Cups recipe has just a handful of ingredients, and I bet you have all of them in your pantry. 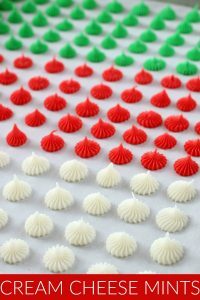 You can make them plain for any occasion, or use a heart shaped silicone mold for a special Valentine’s Day treat. Fill mini muffin tins with mini paper liners. Drop teaspoonfuls of chocolate mixture into paper liners. Top each with chocolate mixture to cover. 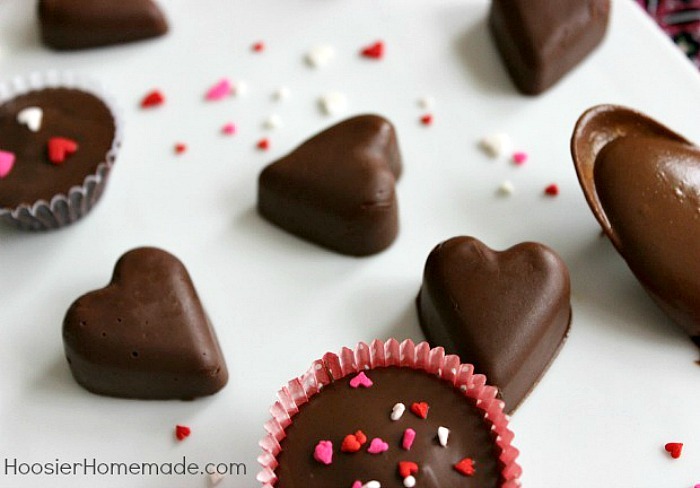 For the Heart Shaped Peanut Butter Cups, fill a piping bag with chocolate mixture, fill a heart shaped silicone ice cube mold about 1/2 full with chocolate mixture. Add a small amount of peanut butter mixture, fill to the top with chocolate, covering the peanut butter. Place in fridge until set, turn over and pop out of mold. 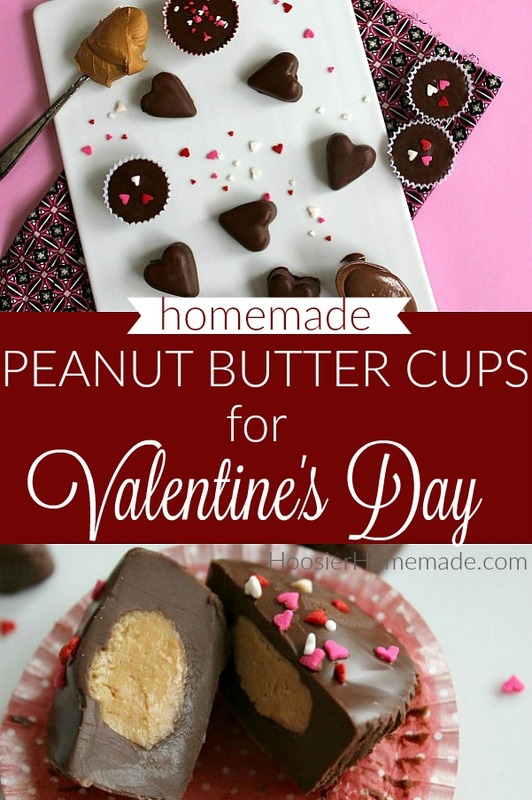 The Peanut Butter Cups can be made a couple weeks in advance, just store them in an airtight container in the fridge until you are ready to give them as gifts or serve them at a party. 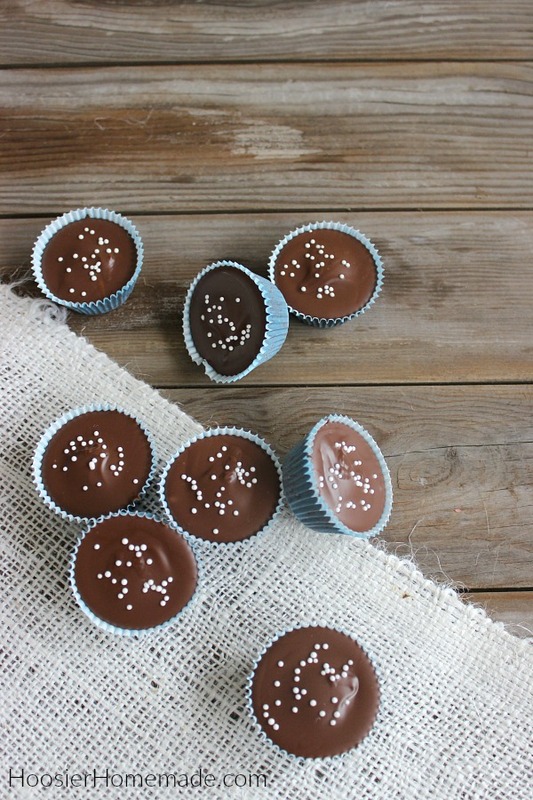 While we love Reese’s Peanut Butter Cups, there is really nothing that compares to the richness of a Homemade Peanut Butter Cup. 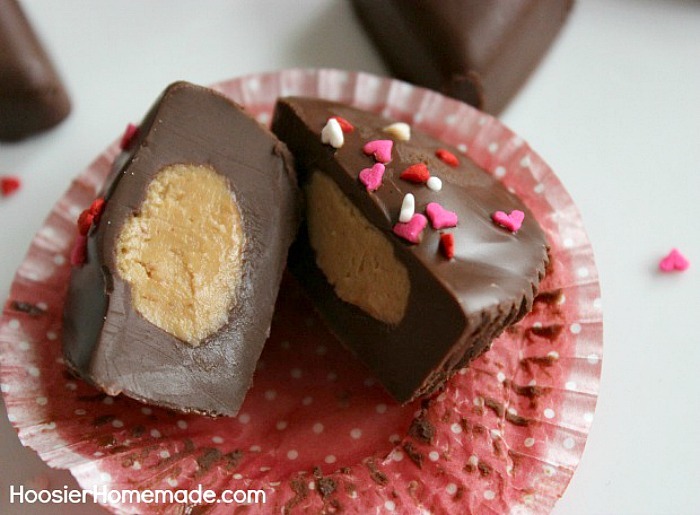 One of the best things about this Homemade Peanut Butter Cups recipe is how versatile it is. The ideas are endless for colors of cupcake liners and sprinkles. You can make them for Bridal or Baby Showers and use pink, blue and white – or match of the theme of the shower. Birthdays, Potlucks or Backyard Parties are also great ideas. 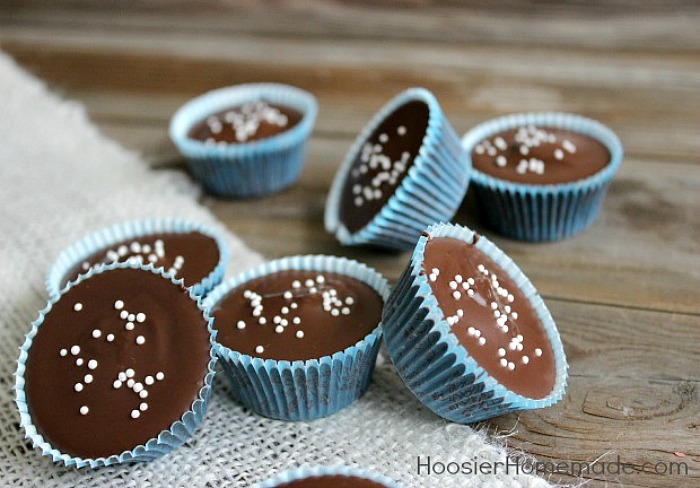 For these Peanut Butter Cups they are made in blue mini cupcake liners and a sprinkle of white nonpareils on top. These would be perfect for a Winter party, birthday celebration or even a baby shower! 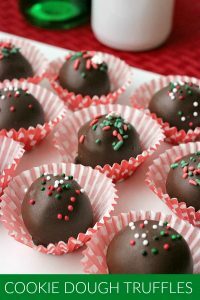 This recipe also makes a lot – 35-40 candies, so one batch will go a long way, especially as gifts. Add them to cellophane bags, tie with baker’s twine or a ribbon and you have a fun little gift for teachers, neighbors, co-workers and more. Looking for more quick candy recipes? Click on the photo for the recipe! 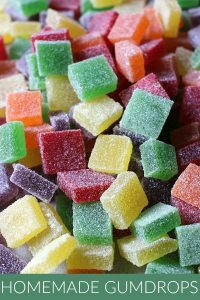 Change the flavors or colors on any of these candies to fit the holiday, season or occasion. Store in an airtight container in the fridge until ready to serve. 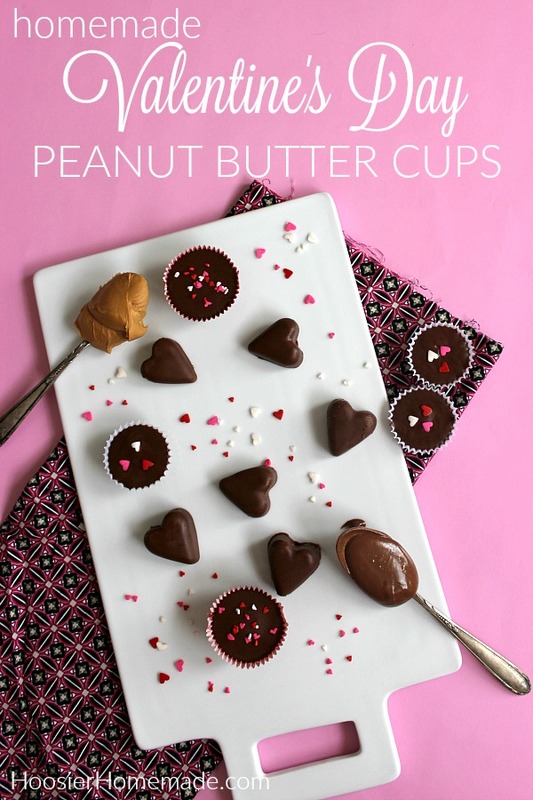 You may have some peanut butter mixture left over depending on how much you add to each cup. You cups look great!! I made Lynn’s version for Christmas. Now I have your recipe, too! Awesome! .-= Lisa@blessedwithgrace´s last blog ..Tempt My Tummy Tuesday… The Tuna Salad Sandwich =-. .-= Angie @ The Country Chic Cottage´s last blog ..Winter Touches via Epsom salts =-. .-= Amy´s last blog ..Chocolate…. =-. Oh yum! These look so good! Wish I had a few to munch on! .-= Alexis AKA MOM´s last blog ..Tempt My Tummy Tuesday ~ Cheesy Baked Chicken Enchiladas =-. Wow those look so good. My daughter would love to put the little sprinkles on top! .-= Candi´s last blog ..RECIPE: Breakfast Burritos =-. .-= Nutmeg Nanny´s last blog ..Out and About – Hosmer Mountain Soda =-. You make it look so easy. Are they sticky? I know nothing about candy making but I remember my Mom melting wax with chocolate as a kid to make it smooth/harden. Do you need that here? .-= Shannanb aka Mommy Bits´s last blog ..Mouthwatering Monday – Eggplant Parmesean =-. @Shannanb aka Mommy Bits, The Peanut Butter Cups are not sticky, they harden while setting up in the frig. No, you don’t need wax, just the chocolate and peanut butter. Thanks for visiting! @CupcakeLady, Thank you! Like I said my cooking skills are in the early stages! oh my! As my husband would say “I’m all over that” ! I love peanut butter and he loves peanut butter cups. Wouldn’t he be impressed with me if I made these for him?! hmmmmm….. thanks for the post! .-= Jeanette´s last blog ..TEN MOST UNIQUE CHURCHES =-. 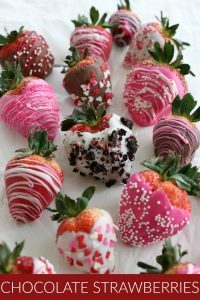 I am going to make these for my husband’s birthday! He’ll love these! @rachel-asouthernfairytale, That’s a great idea! Thanks for visiting! .-= Teresa´s last blog ..Beef and Broccoli =-. My fam will love these! .-= Netta´s last blog ..Opening Day! Real Church Midtown Detroit =-. @Sabrina, Wow, you were up bright and early to make them already. I’m so glad you like them. Thanks for visiting! These are unbelievable. They are the combination of the best tastes. I must make these for my class. They say thanks, in advance. So do I. .-= Chaya´s last blog ..Omelet Muffins =-.